Boyds, Md. 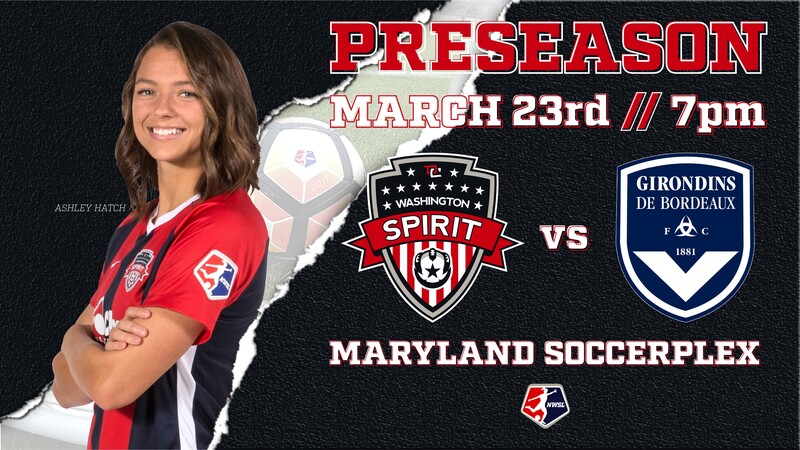 (3/22/19) – The Washington Spirit will match up against Bordeaux from the Division 1 Feminine, the premier women’s league in France, on Saturday, March 23. This is the Spirit’s first game at the Maryland Soccerplex since the conclusion of the 2018 NWSL season. The Spirit began the preseason against James Madison University in a game held at City Stadium in Richmond, Va., a 5-0 win that saw forward Ashley Hatch secure a brace in just 26’ minutes and the Spirit hold JMU to only one shot on goal. The Spirit will be looking to carry over their offensive momentum and defensive fortitude as they face their first fully-professional team of the year in Bordeaux. In their second of four preseason games, the Spirit will face a strong Bordeaux side that is currently sitting third in the table behind only Lyon and Paris Saint Germain FC. Bordeaux’s form has been impressive as of late, as the south-east French side has won 5 of their last six games in league play, including a big 4-0 victory over Toulouse. Bordeaux brings with them Viviane Asseyi, an attacking midfielder who has made a habit out of finding the back of the net, having scored 11 goals, fourth-best in the league. In addition, Bordeaux will feature goalkeeper Erin Nayler, who has kept seven clean sheets in 18 league games thus far. Kickoff at the Maryland SoccerPlex is set for 7 p.m. EST on Saturday, March 23 with gates opening at 6 p.m. EST for all ticket-holders.